In recent years, German football has seen a bit of a revival. I mean, they’ve always been annoyingly brilliant at international level, but after a few years in the doldrums, where the Premier League dominated, the German teams seemed to have resorted to something that the English ones seem to be against – fan power. With cheap tickets and amazing fan experiences, it is no surprise games across Germany sell out, whereas similar games in the UK have empty seats. Therefore, it was seen as a welcome slap in the face when – in the 150th year of the Football Association, the final at Wembley was played between two teams from the Bundesliga: the all powerful Bayern Munich, and the plucky fan favourite club Borussia Dortmund. After seeing the wall of yellow that was present at Wembley, I decided to see what the fuss is about, so after obtaining tickets via a third party for a little more than I’d have liked, I headed to Dortmund to see my first ever Bundesliga game. That day’s opponents were Hanover 96, a team that were no slouches themselves (they are knocking on the door of the Europa League spots), but even though they were present in a small part of the ground, that Saturday was very much a home tie in Dortmund. 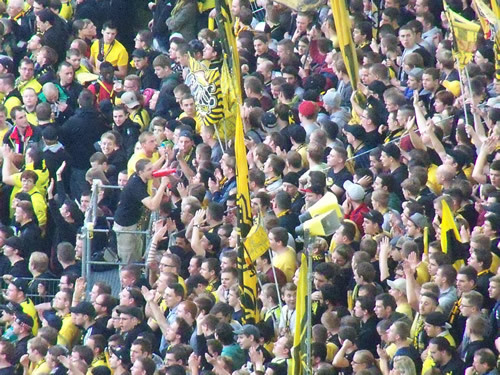 On arrival into Dortmund the day before, I was surprised to see how much the city love their football team. Shops are everywhere with every single piece of Dortmund related memorabilia you can imagine. 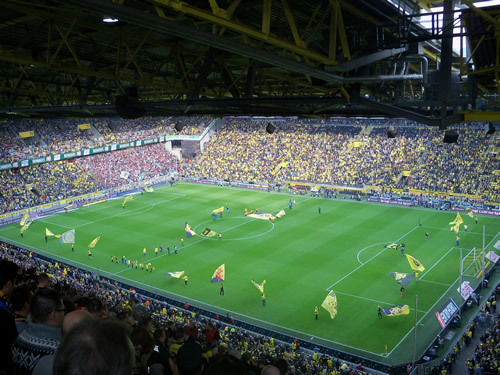 With very little tourism, a lot of people come to the city just to see the football – indeed it was only one of possibly two things that is mentioned in the “Things to Do in Dortmund” section. I suppose it is becoming popular now as you can now nearly afford to get a flight to the city and a ticket for the match at the same price as a Premier League match in the UK. That’s more than a little scary. Most people walking around town did seem to wear a scarf either adorned with the crest, in the colours, or both. Being one to desperately try and fit in, I purchased my own scarf, a fairly inoffensive yellow and black number with a crest on it and the year of formation on the other end. I also bought the standard pin badge as well. As I went about town on the day of the match, I was surprised how busy it was. As somebody who lives in Manchester, who generally tries and avoids the city centre on a Saturday afternoon, I was surprised that it seemed like almost everybody was going to the match. I think this is because Dortmund only has one side to the best of my knowledge, and unlike Manchester there is generally only one game in the city on any given day. Sure the derby is a little busier, but still it struck me how busy it was. After navigating the Dortmund underground (and looking incredibly foolish in the process, as a couple of drunk Polish people took a shine to yours truly), I headed to walk around the stadium. It was huge and with over 3 hours to go before kick off it was rammed already. One such area that I was keen to check out was “Dortmund Live”, a fan-zone like area where you could watch highlights, drink beer and eat Bratwurst with your fellow Dortmundites, with inoffensive music playing in the background. I’m a big fan of these “Fan Zones”, as it’s something the Americans do for their sporting events and they do it well. Unfortunately as traditionalist and alcohol adverse the UK is with sport I can never see them taking off in the UK, which is a shame as every single time I’ve been to a fan zone they have been fun. Dortmund was the best though, with the music and the table layout it felt more like a beer festival than the prelude to a Bundesliga clash. After taking a seat, I got chatting to a few locals: which at the time of writing 5 nights before the end of my holiday, was probably my favourite moment of the trip. I loved it. The locals were friendly and accommodating to my terrible grasp on the Bundesliga and my even worse grasp of German, and offered to meet me back after the match for more beers. More beers is generally pretty good so yes! I was directed to the entrance at the south west of the stadium, and could not believe the people there. There must’ve been about a thousand or two people trying to get into that area of the ground. Stopping them was around 4 or 5 stewards, who were efficiently searching everybody for concealed weapons. I got in, but it was a little late, so when I was still outside the stadium when Dortmund’s anthem rang out (You’ll Never Walk Alone), I sprinted to my block in the hope of catching a few notes of the Dortmund faithful singing. Alas it wasn’t too be, but even though I was dying from sprinting up 8 flights of stairs which brought on a bout of dizzyness, I did manage to catch kick off. Straight away I can see why Dortmund is popular with groundhoppers the world over. The noise from the West Stand (and yes, it is a stand, no seats can be bought there) was deafening. Leading the way was this one chap who wasn’t appearing to be watching the game, instead standing facing the crowd, with a megaphone! It was an incredible sight and the noise was electric. Unfortunately with the amount of German words I know limited to the numbers 1 to 10, yes, no, please, thank you and how to order a beer, I couldn’t make out the chants. Instead I just sang along to the familiar tunes heard all over the world in football stadia. And “Hey Baby” by DJ Otzi. Dortmund took an early lead. 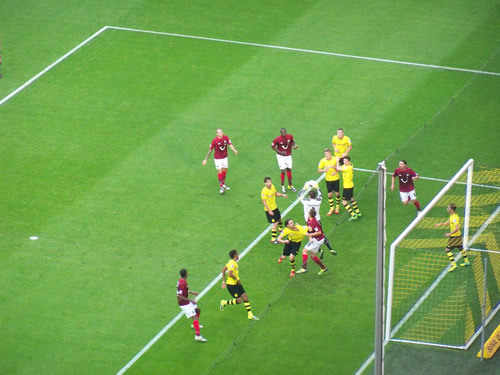 This happened with a penalty converted by Marco Reus after Hiroki Sakai brought down Erik Drum in the box. With noise echoing around the arena, the home team were expected to capitalise on their early goal. However even after chances and a fair few corners, the score remained 1-0 to the home side at the break. I went to get one of those massive German Pretzels you occasionally see knocking about in the UK, but was surprised to learn that I couldn’t pay with cash. Instead I had to buy a card and use the money on that to pay for food, drinks (yes, you could drink in the stands. In fact they had people selling beer in your seat! Marvellous!) or the odd souvenir. I got one with €5 on it, but with pretzels being €2.60, I was left with a souvenir of my visit. Ho hum, never matter. The second half came and it was more of the same really. Hanover rarely threatened to break the defence of Dortmund but – even after 12 or 13 corners, the home side had few chances. This did lead to a few angry home fans after chance after chance was squandered, which was compounded when news of both Shalke and Bayern Munich were winning after going behind. There is nothing scarier than an angry German fan at football, let me tell you! As the match went on though there were celebrations, as it became more and more likely that Dortmund would hold on for a victory. That they did, sending the home fans who were angry before into delirium. The home side celebrated in front of the West stand, who were obviously delighted with the result. After soaking up the atmosphere one last time, I headed back to Dortmund Live, where much beer was drank and Bratwurst was eaten in the company of new found friends until late into the evening. 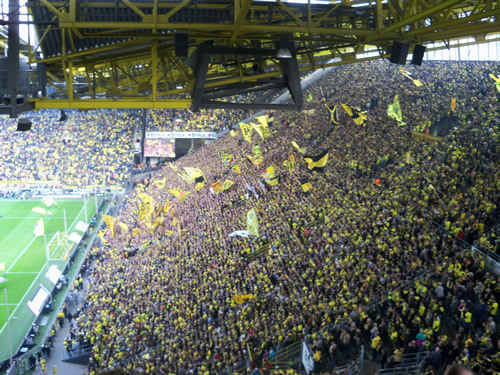 A lot has been said of the experience of seeing Borussia Dortmund, as a team they are regularly mentioned on those lists of “100 teams you must see before you die”, but it’s hard to describe why. Everybody is so friendly (even though the performance against Hanover wasn’t the best), and the while you experience the noise and the atmosphere that you see on TV, it really doesn’t tell the whole story. In fact the home game seemed to be akin to an Oktoberfest, inconvenienced with a football match in the middle of it. And that – my friends – isn’t a bad thing in the slightest. Rhys Wynne is the editor & creator of You're Supposed To Be At Home. For his sins, he is a Colwyn Bay & Liverpool fan, and a serial blog creator. You can follow Rhys on twitter here. Get posts delievered direct to your email inbox! © 2019 You're Supposed To Be At Home. All Rights Reserved.